There are a lot of tools out there for counting your stitches on a gauge swatch. Here are three that I like and use regularly. 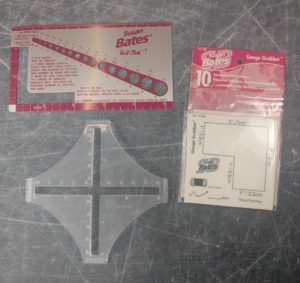 My good ol’ Susan Bates ruler: Gauge rulers like this come in many variations, but the all involve an L-shaped hole in some kind of rigid material. Lay it over your swatch, line up the L to a horizontal and vertical line of stitches and count away. Double the number you get to find your gauge over 4″ (10 cm). The Gauge Grabber: These are designed to be one time use and may even be intended to keep on your swatch permanently, but I tend to use them several times until the sticky stops sticking. What I like about these is that it’s a bit easier to count partial stitches than the opaque tools like my Susan Bates ruler above, because you can see the partial stitch on either side of the dividing line, making it easier to tell if that partial stitch is a 1/2 stitch or closer to a 1/4 stitch. I also like that once they are stuck to the swatch, the stitches underneath don’t shift or move about, so they help keep me honest and make it harder to just give that little tug to make the gauge work out. The Akerworks Swatch Gauge: To use this ruler, you need to have a good sized swatch– ideally about 6″ (15 cm) square, really. Gripping feet on four sides of the ruler keep your swatch from moving while you count. And the semi-translucent plastic helps you judge the actual size of those partial stitches. It has the widest counting space of the tools I’ve talked about, and the more inches you count, the more accurate your numbers will be. 4″ (10 cm) is the standard used in most patterns, so you can make a direct comparison to what’s written in your pattern. No matter what ruler I use, I often count my stitches in several places on the swatch, just to see if there is any variation (and if there is, I go with the average). On smaller projects, or ones where I’m familiar with the yarn, or ones where gauge won’t make a difference in wearability, I might just cast on and check gauge as I go because it’s not much work to frog a small project and a shawl that’s an inch or two larger or smaller won’t bother me. If I’m making something where fit counts, it’s a new yarn, and/or it has more than a skein of yarn involved, I make a good sized gauge swatch worked flat or in the round as the pattern will be worked and I play with needle sizes till I get what I want.